Craft cider makers share a common aim – a desire for a natural product that benefits the environment, involving locally grown produce with a clear provenance and low food miles. To have a close connection to the local environment and its traditions, and a preservation of something of the past amid our increasingly modernised lives. And local produce tastes good. As a nation we’ve become used to getting oranges from California, asparagus from Peru. It’s genuinely unusual for people to experience a world class, locally sourced product. It’s time to change that. So much of our food and drink is transported around the world, clocking up so-called ‘food miles’, that it has become a significant source of CO2 pollution, one of the gases that cause climate change. Even when produce is grown in the UK, the big supermarkets transport it around the country to be processed and packaged before it reaches the customer. We grow amazing apples here in the UK, let’s celebrate that. Buy Essex apples and drink Essex cider. 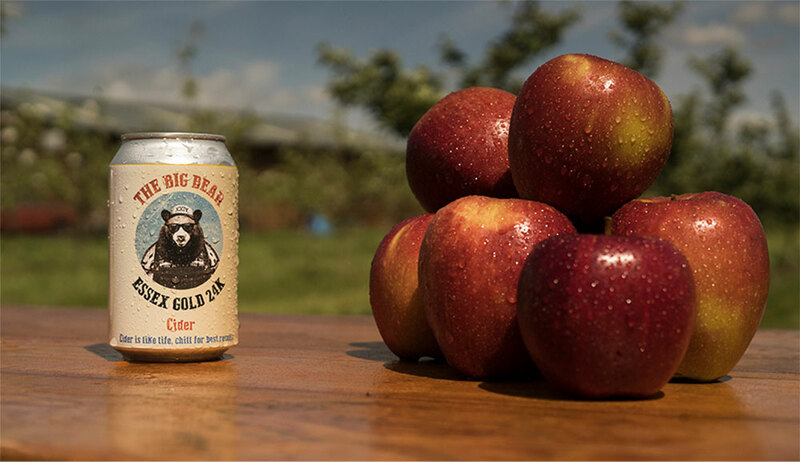 Buy The Big Bear Cider. A taste of Essex.